The Centre is the BC convener for the We Are Cities initiative. 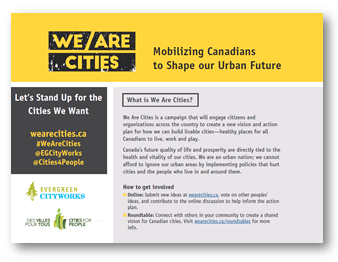 Coordinated by Evergreen Cityworks and funded by the McConnell Foundation, ‘We Are Cities’ engages Canadian citizens and organizations in roundtable discussions across the country to shape a collective vision, policy and action plan for cities – exciting and healthy places to live, work and play. The Centre hosted a number of roundtables around BC including Vancouver, Victoria, and Burnaby. Key Deliverable: Roundtable discussions to get input on a ideas for a national policy and action agenda.